The small forward (SF), also known as the three, is one of the five positions in a regulation basketball game. Small forwards are typically shorter, quicker, and leaner than power forwards and centers, but typically taller and larger than either of the guard positions. The small forward is considered to be perhaps the most versatile of the five main basketball positions. In the NBA, small forwards usually range from 6' 6" (1.98 m) to 6' 10" (2.08 m) while in the WNBA, small forwards are usually between 5' 11" (1.80 m) to 6' 2" (1.88 m). Small forwards are responsible for scoring points, defending and often as secondary or tertiary rebounders behind the power forward and center, although a few have considerable passing responsibilities. Many small forwards in professional basketball are prolific scorers. The styles with which small forwards amass their points vary widely. 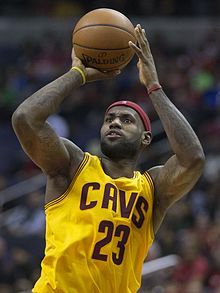 Some players at the position are very accurate shooters, others prefer to initiate physical contact with opposing players, and still others are primarily slashers who also possess jump shots. In some cases, small forwards position on the baseline or as off-the-ball specialists. Small forwards who are defensive specialists are very versatile as they can often guard multiple positions using their size, speed, and strength. ^ Recruiting Nation (November 28, 2006). "Versatility is key for small forwards". ESPN. ^ "NBA.com - Players and Positions". www.nba.com.